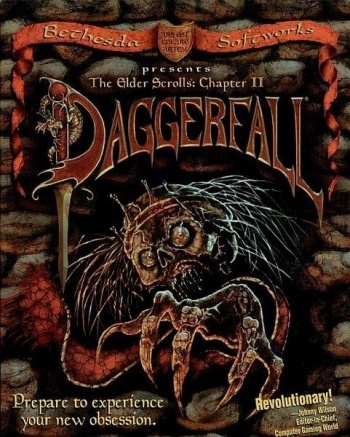 To celebrate the 15th anniversary of The Elder Scrolls franchise, Bethesda is releasing the second game in the series, Daggerfall, for free. If you've never tried any of the Elder Scrolls games before Morrowind or - you can admit it, I won't revoke your gamer cred - before Oblivion, today's your lucky day to experience some Bethesda history in the free and legal way. To celebrate the 15th anniversary of the series and "despite saying we'd never do it," the company has released a free version of The Elder Scrolls II: Daggerfall to download. There are no strings attached here, and Bethesda's only being consistent: the developer did the same thing five years ago for The Elder Scrolls' 10th anniversary when they released The Elder Scrolls: Arena for free. But Daggerfall does come with a few warnings. This game came out in 1996, which means that it's not exactly the prettiest looking thing out there, though it's certainly not without its retro charm. That's not really the issue, though. Bethesda is releasing the game as it is, and they're not going to tinker with the game to make sure it runs compatibly with modern operating systems. They don't have plans to support the release with any customer support either (though I'm sure you'll find people in the Elder Scrolls community to be helpful if you need it). So, you need to run the game in DOSBox in order to get it to work. It's really not all that hard, but you should definitely read through the detailed instructions Bethesda's Mike Mazzuca put together for installing and running the game. So yeah, if you're new to this kind of thing, you'll have to put in a little work to get Daggerfall to run (you might also have to wait, because for some reason Bethesda's servers are being awful slow coughing out the 150 MB download). But if all those curmudgeonly old school Elder Scrolls fans are right, it should be worth it.